UPDATE: NOW AVAILABLE AS A PREPRINT – INCLUDES CODE TUTORIALS FOR MATLAB, PYTHON, AND R! Like many of you, I love ggplot2. The ability to make beautiful, informative plots quickly is a major boon to my research workflow. One plot I’ve been particularly fond of recently is the ‘violin + boxplot + jittered dataset’ combo, which nicely provides an overview of the raw data, the probability distribution, and ‘statistical inference at a glance’ via medians and confidence intervals. 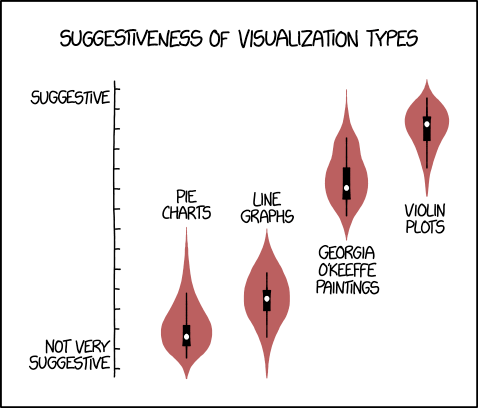 However, as pointed out in this tweet by Naomi Caselli, violin plots mirror the data density in a totally uninteresting/uninformative way, simply repeating the same exact information for the sake of visual aesthetic. Not to mention, for some at least they are actually a bit lewd. In my quest for a better plot, which can show differences between groups or conditions while providing maximal statistical information, I recently came upon the ‘split violin’ plot. This nicely deletes the mirrored density, freeing up room for additional plots such as boxplots or raw data. Inspired by a particularly beautiful combination of split-half violins and dotplots, I set out to make something a little less confusing. In particular, dot plots are rather complex and don’t precisely mirror what is shown in the split violin, possibly leading to more confusion than clarity. Introducing ‘elephant’ and ‘raincloud’ plots, which combine the best of all worlds! Read on for the full code-recipe plus some hacks to make them look pretty (apologies for poor markup formatting, haven’t yet managed to get markdown to play nicely with wordpress)! A ‘raincloud’ plot, which combines boxplots, raw jittered data, and a split-half violin. Let’s get to the data – with extra thanks to @MarcusMunafo, who shared this dataset on the University of Bristol’s open science repository. Although it doesn’t really matter for this demo, in this experiment healthy adults recruited from MTurk (n = 2006) completed a six alternative forced choice task in which they were presented with basic emotional expressions (anger, disgust, fear, happiness, sadness and surprise) and had to identify the emotion presented in the face. Outcome measures were recognition accuracy and unbiased hit rate (i.e., sensitivity). Now we’re ready to start plotting. But first, lets define a theme to make pretty plots. Et voila! I find that the combination of raw data + box plots + split violin is very powerful and intuitive, and really leaves nothing to the imagination when it comes to the underlying data. Although here I used a very large dataset, I believe these would still work well for more typical samples sizes in cognitive neuroscience (i.e., N ~ 30-100), although you may want to only include the boxplot for very small samples. I hope you find these useful, and you can be absolutely sure they will be appearing in some publications from our workbench as soon as possible! Go forth and make it rain! Thanks very much to @naomicaselli, @jonclayden, @patilindrajeets, & @jonroiser for their help and inspiration with these plots! Bon Voyage – Neuroconscience goes to Cambridge! A Retrospective and Thank You. These were so beautiful and informative that I wanted to add them to my manuscript, but I get a ‘404 Not Found’ error for the flat_violin plots… Could you tell me when everything is up? Will update the post to fix this. OK, managed to fix it so everything should show up correctly and be copy-pastable into your r-code. Thank you for the beautiful plots and code! Great post and thanks for sharing!! As a personal comment, I prefer the last two versions (with categorial variable on the horizontal axis). I find them clearer than the other ones. Why are there vertical/horizontal strips in the point plots? Is that from the data or an artifact of the plotting? Is the file still there?